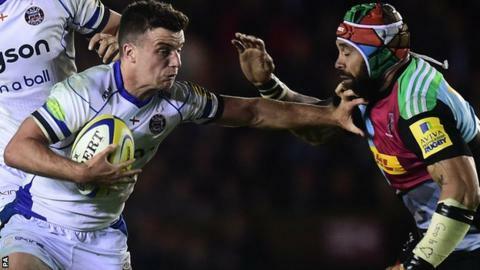 England fly-half George Ford has been named the Aviva Premiership Player of the Season. Ford, 22, has helped Bath into the Premiership semi-finals for the first time since 2010. Ford's father Mike, who is in charge of Bath, was named Guinness Director of Rugby of the Season, while Exeter's Henry Slade won the Under-23 award. Wasps scrum-half Joe Simpson won the Try of the Season for his stunning solo effort against Exeter.